We had an amazing and very relaxing time on vacation! A post will follow soon with pictures, and details...after I finish unpacking, settling back in to reality...oh, and kicking this cold I seem to have picked up some where between Puerto Vallarta and home. Ugh! 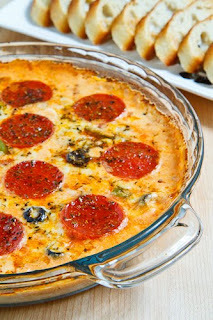 Today's recipe will be a hit at your next holiday party or potluck! Enjoy! Mix the cream cheese, sour cream mayonnaise, mozzarella and parmigiano reggiano and spread it across the bottom of a pie plate. Spread the pizza sauce on top and sprinkle on the cheese, pepperoni, green pepper and olives. Bake in a preheated 350F oven until the sides are bubbling and the cheese cheese has melted and turned golden brown on top, about 20 minutes. Dip or use as a spread on slices of baguettes or other breads/crackers. Looks good, doesn't it? It's definitely as good as it looks, I promise. Maybe not very low fat, but that's why you can just save it for your holiday get togethers when everyone is supposed to indulge! Now I'm off to download the millions of vacation pictures I have sitting on my camera...I'll be back soon with my vacation post! Whoa! That looks yummy. I bet it would be a hit at a party. Hope you are feeling better soon! Ha! I'm totally making this for dinner one night. see the pics!!! and that pizza dip, oh my yumm. yes please.